On this page you'll find our explanation of the Ascension game mechanic in FGO. 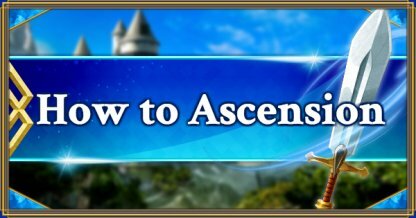 We'll tell you how to Ascend, and which Servants you should Ascend first. Please use this as your guide when performing Ascensions in FGO. How to Ascend and what are the conditions? The Ascension mechanic allows you to increase your Servant's Level cap. Regardless of rarity, Servants can only Ascend four times. On the 4th Ascension the character's card art, called their "Saint Graph" dramatically changes. Although the number of times a Servant can Ascend is fixed at four regardless of rarity, the maximum Level they can be raised to with Ascension does vary. This Level rises in proportion to their rarity. It's possible to train a ★5 Servant up to a Level cap of 90. Essentially new Skills are unlocked on the first and third Ascensions, benefiting you by expanding a Servant's range of use. A very small number of Servants unlock their third Skill by Ascending for the final time and clearing Interlude and Rank Up Quests. 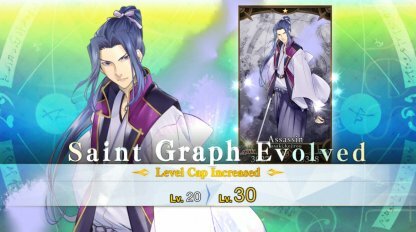 The second advantage to Ascending is that by increasing a Servant's Level cap and further raising their Level, it's possible to boost their Status even more. This is especially beneficial to Low Star Servants with a low initial maximum Level. On the first and third Ascensions, a Servant's illustrations and Character Skin used during battle will change. This doesn't directly alter their abilities, but is fun and acts as a motivating factor. On the fourth (and final) Ascension, although their Character Skin won't change, a specially illustrated card art becomes available. Ascensions can be performed by choosing the "Ascension (Servant Evolution)" option in the Enhance screen, found in the MENU tab. In order to perform an Ascension, a Servant must have been Enhanced until they are at their Level cap. In order to Ascend, not only must Servants be Enhanced until they've reached their Level cap, they also need Items and QP. The Items necessary depend on the Servant - and the amount of QP depends on their rarity. The amount of Items and QP needed for Ascension goes up in proportion to a Servant's rarity. Also, there are some Items that are impossible to acquire until certain parts of the story have been cleared, so in the early stages of the game Ascension for some Servants can be a problem. It is best to unlock Skills as early as possible that enable new actions, such as NP gauge charge or Evasion. If you don't have access to these Skills without Ascending, you should focus on Ascension as a priority. Low Star Servants who need less Items to Ascend can be Ascended even very early on in the game. It's a good idea to focus on these Servants whose Items are easy to come by, rather than High Star Servants who require Items difficult to farm.